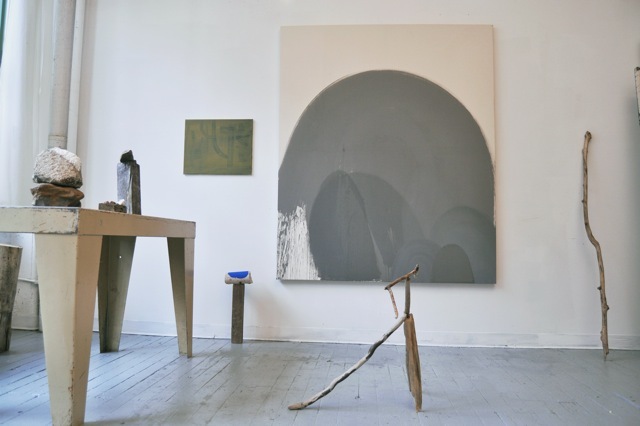 Benjamin King’s recent paintings and sculpture dig into metaphysical terrain, but are also firmly rooted in the materials and physical process of painting, not to mention the planet outside his studio. These areas of focus are evident in a large-scaled black painting that hearkens back to Rothko’s late Chapel works. Acned with stone fragments, glitter and lumps of medium and paint, this painting invokes Rothko’s gravitas, but without the associated angst. A down to earth kind of spirituality, if you will. (It merits mentioning that King is an avid rock climber). Blobby forms appear on either side of the canvas, resembling lava lamp ooze floating to the surface. 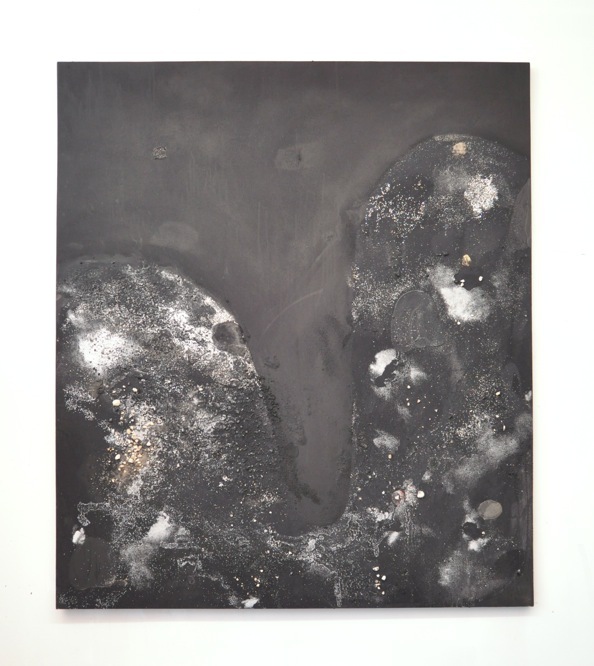 They suggest an evolutionary phase in the history of a prehistoric place, but also seem apparitional and without absolute reference–both solid and transparent, apropos of the kind of metaphysics at work in his studio. 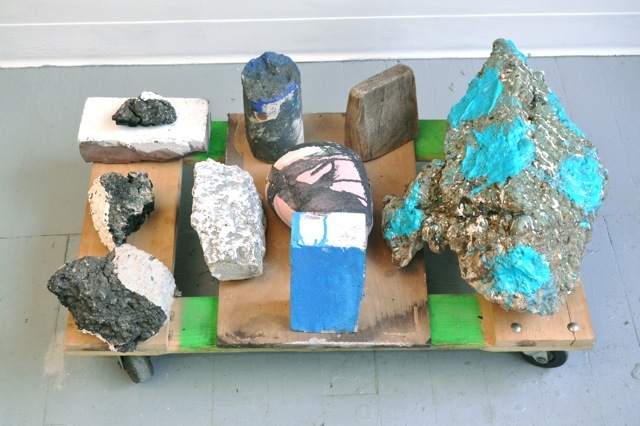 The presence of natural objects in the above work highlights a relationship between King’s studio practice and his movements in the world, his practice of collecting objects outside of the studio, sometimes rearranging them where found, and sometimes hauling them back to the studio for some doctoring up. In this case, the medicine is paint or, stretching the metaphor over into psychology, group therapy for objects. 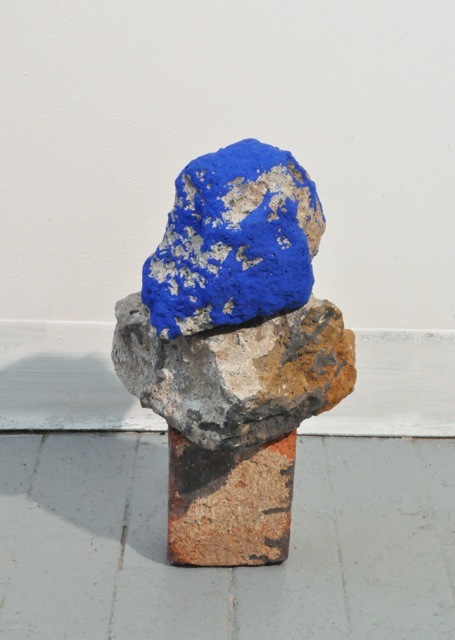 Dozens of small sculptures composed of stacked and painted rock, wood chunks, and branches, methodically arranged on various surfaces (including a long row of radiators under some windows), people King’s space. Some of the groups sit on palettes that can be wheeled around the room. Others rest within improvised sand boxes atop weathered, metal tables. (King has also been collecting this particular kind of table which I’ve seen used as bases for industrial sinks). I can’t help but anthropomorphize King’s stacked stones and chunks of wood and imagine them in conversation with one another as well as the paintings that border them. They loosely remind me of recent work by Jennifer Reeves who constructs small, abstract sculptures out of mixed media and photographs them in real landscape settings. 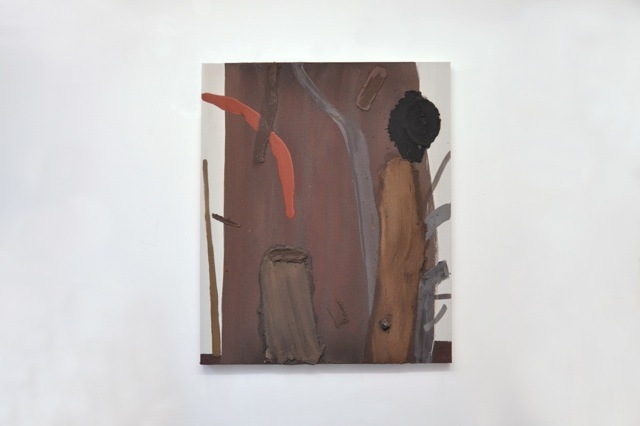 Both Reeves’ and King’s share a common genealogy with roots in abstraction. In contrast to Reeve’s narrative photographs, however, King’s tableaux don’t direct the narrative nor hint at a relationship to specific events; but instead work like three dimensional sketches that both comment on King’s studio practice and reveal the artist as a flaneur and collector. They also beg many questions (beyond the scope of this article) about what happens to an object once its relationship to a place and history gets severed. Maybe we just call that art. The original roads in Brooklyn have these huge wood beams that run across the road like the wood in train tracks. The city was probably trying to access something beneath this strata and had to cut out this wood that has been buried for more than half a century. The wood was covered in mud and mold. I let it dry for weeks then cleaned it. I did not change the form of it at all though. 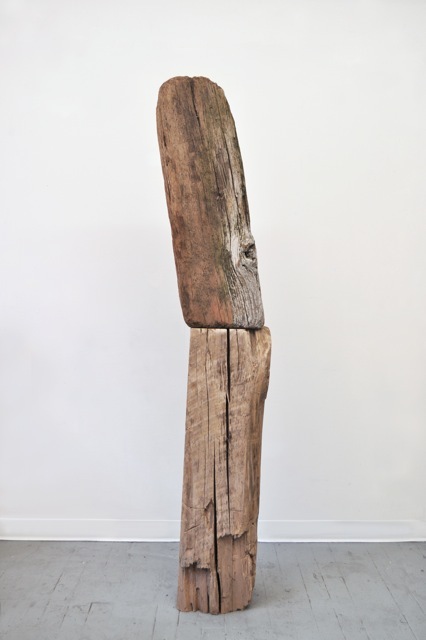 The top piece is drift wood from red hook probably once part of a pier. The pieces were found many months apart from each other. The red hook piece I found last fall and the other the spring of that same year. When I got them in the same room it was pretty clear right away that they went together. This piece effectively functions as a totem to myriad histories and purposes, but without the incumbent symbolism associated with totems. It also has a machine-like presence that reminds me of a primitive clock or antenna. There is a complex collaboration at work here as well between nature, historical context, and the artist. All of these forces have left a variety of natural and human-made hieroglyphics, mixing languages of chance with utility, and colluding finally with the speculative physics King applies to reconstruct and reorient time. All of the works I saw this day at King’s studio shared a primordial physics that oscillates between moments of light and heavy gravity. The brownish painting below, for example, with its variegated thicket of marks, and trunk-like form dominating the background, appears at first intractably dense. But each mark also seems to exert its own force and place against the others like a cluster of negatively charge particles. The scene feels like a compression of energy that is ready to burst. A larger canvas against another wall extends the metaphor of energy in a more subdued direction. In this work, a background of raw canvas forms an arc over several foregrounded mound shapes. The paint here is thinly applied with an economy that King likens to “sword strokes”. The painting reminds me immediately of Milton Avery’s reductive approach to the landscape, only here the allusions to landscape maintain a coy ambiguity. The mounds, painted in different values of gray, huddle along the bottom edge of the canvas, inviting a number of readings, but also satisfying as abstractions without a necessary context. They seem at once monumental and minute, potentially referencing mountains from a distance or pebbles up close. After awhile I start to see them as figures, and then sheets shrouding something indefinite but substantial. Perhaps that last reading is a decent way of characterizing the kind of abstraction King is up to in much of his work. Invisible but there. Really good and informative text !